Apoorva Prakash, part of the kitchen team at Masque, Mumbai, gives us an insider's tour of the deliberation and experimentation that goes into creating a seasonal menu. The clock strikes 7. It is nearly show time. The electric energy in the room is a far cry from what it is at two in the afternoon, when our shift usually begins. Chef Prateek Sadhu, owner and head chef, has returned after a week of foraging in Kashmir. That can only mean one thing — it is time for a change in the 10-course degustation menu, here at Masque. Masque draws its name from the word masquerade, a form of aristocratic theatre dating back to 17th century Europe. Tucked away in a quiet corner of Shakti Mills in Mumbai, Masque embodies culinary theatre. Behind the curtains, the stars of this show are the pristine ingredients sourced from Kashmir, the Himalayan belt, and from closer to home, Offerings Farm near Pune. The restaurant’s unwavering focus has been to redefine Indian food, with seasons and regionality guiding their philosophy. The kitchen is both our playground and petri-dish. Long, gleaming marble white counters and two white-boards play a crucial role in our daily lives. One board keeps track of the number of days since the restaurant’s inception, and makes room for silly, sometimes motivational quotes (my favourite, from Day 849, quoted Bugs Bunny: “Don’t take life too seriously, you’re not getting out alive.”); and the second is dedicated to the research and development of ideas and flavours. At a restaurant, menu changes do not happen overnight. It is a gradual change, just as it is with seasons. On rare occasion, we do wake up to an idea, but most often, when it is time for a menu change, Chef Sadhu returns to his home state of Jammu & Kashmir in the Himalayan belt, to find inspiration. His travels are centred on foraging and learning about indigenous ingredients, while also building relationships with the local farmers, the people who grow his food. He believes that chefs have to truly feel, taste, sense and touch the elements to bring a dish to life. On a recent trip to Aru Valley, Pahalgam, Chef Prateek was on the hunt for various kinds of pine. All of his foraged finds were brought back to his hotel and then shipped to the restaurant. Now spruce, deodar, and fir are being utilised in the making of salt and oils that feature in some of our courses. Spruce is broken down and vacuum-sealed in a bag with oil for a month. 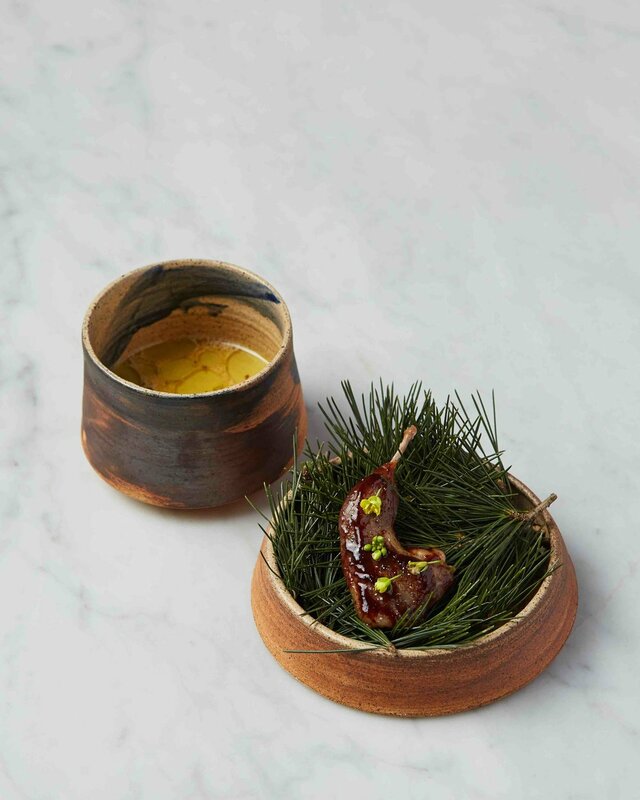 This infused oil is now being poured tableside, to be sipped on as part of the Yakhni course, a winter broth from Kashmir that primarily comprises of yogurt and saffron, served with black-raisin-glazed quail. A taste of the chilly winters of his home state. In Soura, Srinagar, he witnessed the traditional process of smoking fish, known locally as fherigaad. A delicacy around the frosty time of year, fish is laid out to dry for a day, then placed over dry grass that is then torched, to evenly smoke the fish. This concept has been applied to the mackerel toast on our menu, where the fish is smoked on a banana leaf. His most recent visit took him to sample harissa in the Ali Kadal neighbourhood of Srinagar, where each vendor puts their own distinctive spin on this hearty Kashmiri delicacy made from slow cooked lamb. Masque’s winter menu features a take on this classic too. Here, lamb and rice are slow-cooked with fennel and cardamom, topped with rice crisps and dusted with house-made pine salt. 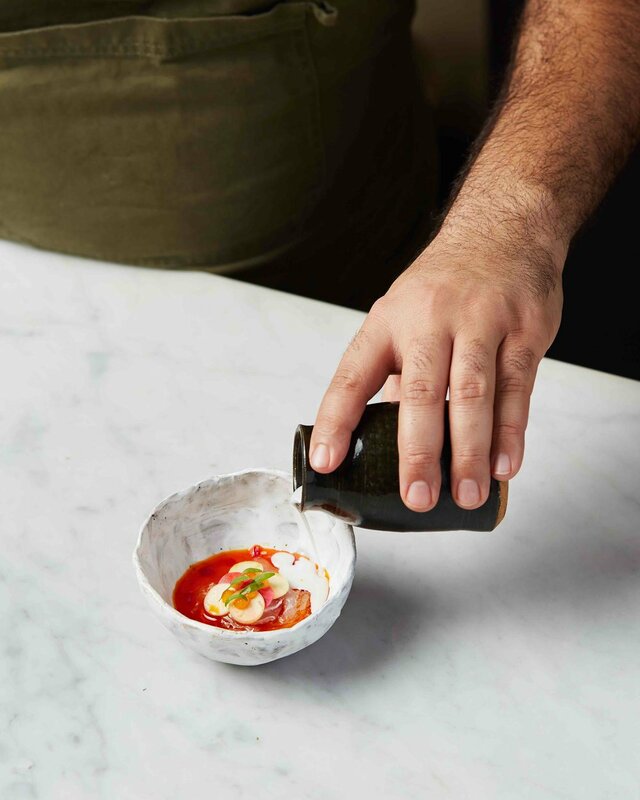 To get to this level of innovation, the kitchen team goes through numerous rounds of trial and error, to attain their version of the perfect dish — in fact, this process of rigour is what usually forges the best of them. If approved by the head chef and complementary to the flow of courses, it makes its way on to the menu. But of course, recipes are merely guidelines to maintain standardisation; the oomph of a dish should be as evident on day 1 as on day 100, if not improved with each iteration. This newest menu at Masque showcases the essence of regional winter foods and ingredients from Kashmir and the Himalayas. It attempts to recreate for diners the severity of the season, and present the creative ways in which locals adapt to the crop change. The menu highlights the concept of dehydrated vegetables (known locally as hoeksyun), and, for non-vegetarians, the exquisite range of meats served in Bizen-ware pottery (a Japanese style of pottery that preserves the temperature of food for a longer duration). Masque uses handcrafted pottery from Curators of Clay, to accentuate each dish. There is also an equal focus on sustainability. Vegetable scraps from the kitchen are saved and used to make stock. The previous day’s Katlam (traditional Kashmiri bread) is made into crumbs for ver, or rice porridge. On the previous menu, apple skins were saved, then dehydrated and powdered, to be crumbled on upside-down apple honey cake served with smoked vanilla ice cream. The final step of a menu change involves assembling each new the dish in the final rounds of trial. Discussions then move to details like cutlery, and most importantly, the language to explain each course, focussing on keywords and ingredients that must be shared with the diner to give him the full experience of a meal at Masque. It isn’t unusual for chefs to share anecdotes on technique, or back-stories on ingredients while serving certain courses. Customer feedback is always taken into account and changes are often incorporated based on their response. Translating ideas from nature to the plate must be an institutionalised effort, not an individual one. Yes, the pack needs a leader, but kitchen culture has to support the process. One way is to encourage the free expression of ideas; to allow each chef, irrespective of rank, to ideate and experiment. The more experienced chefs support the minnows to this end; small is often big when it comes to creativity. Why is it so crucial for establishments to continuously evolve their menu? Chef Prateek tells his team that it stems from the philosophy of respecting, and giving back to nature with gratitude and feeling. Food anywhere in the world, no matter the language or culture, has the ability to inspire customers and bring them back for more. This demands exceptional produce used with skill and dexterity, crafted with creativity, and minute attention to detail. And if you’re doing it right, each new menu change also means an evolution of the restaurant, its team, and every single individual working there. Apoorva Prakash is a freelance writer with a strong affinity for food, travel and culture. Her culinary stints include L’espalier in Boston, GAA in Bangkok and is presently at Masque, Mumbai. All photographs by Rohan Hande.